A special edition for the city state. 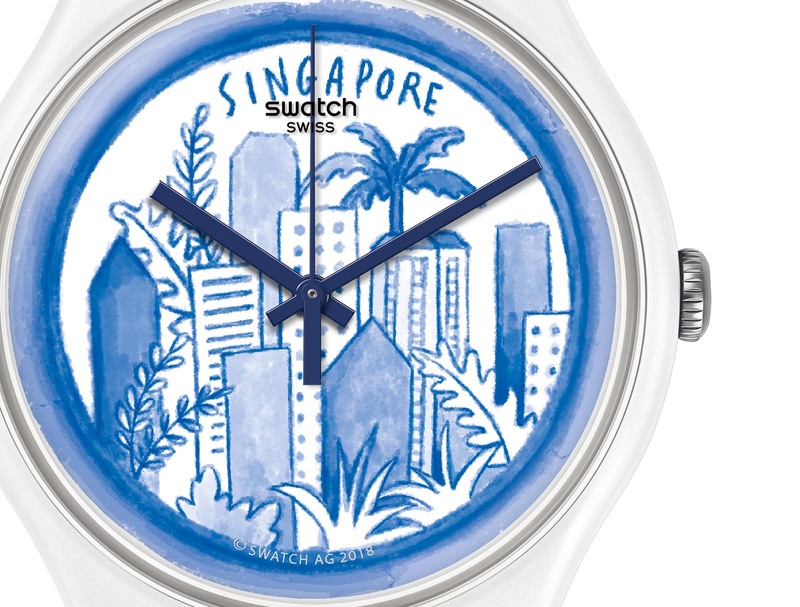 Swatch recently unveiled the Singapore instalment of its popular Destination Watch series, which is made up of special edition timepieces created specific cities. Dubbed the Singapore Tale, the watch is the latest in the series that began in 2016 with Brussels, and now counts over 50 models, each only sold in its respective country. Designed by Singapore artist Tan Zi Xi, the Singapore Tale features distinct cultural emblems of the country, starting on the dial and extending to both ends of the strap. The motif includes landmarks such as the Singapore Flyer Ferris wheel and the seaside park Gardens by The Bay, as well as local cuisine such as chicken rice and also the famous durian. Less familiar to foreigners but fondly remembered by locals are traditional ice cream carts and dragon-shaped playgrounds. Interestingly, Ms Tan steered clear of Singapore’s national colours of white and red, and instead opted for blue and white, which was inspired by decorative Peranakan ceramic tiles. Also known as Straits Chinese, the Peranakan were descendants of early Chinese settlers in Malaysia and Singapore who adopted the local language and customs, creating a distinctive culture. 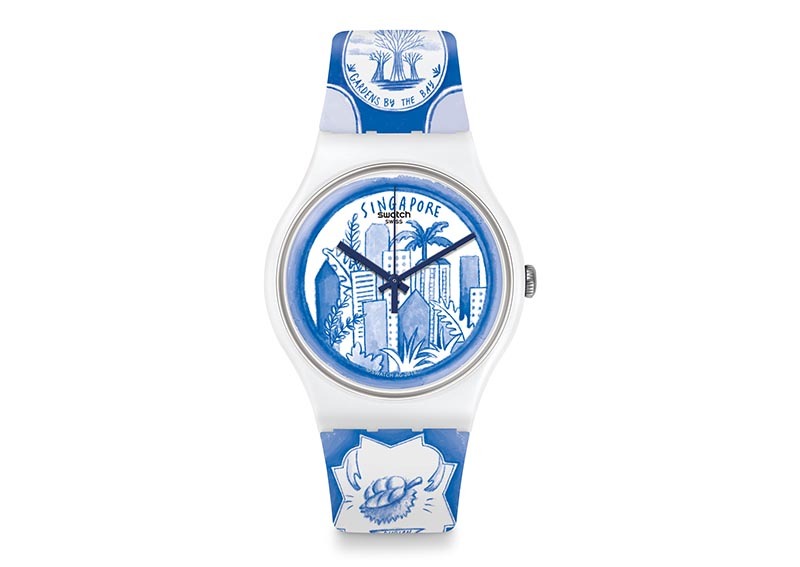 The Singapore Tale is a typical, extra-large Swatch watch. The case is plastic, 41mm in diameter and 9.8mm in height, ands is fitted to a silicone strap. 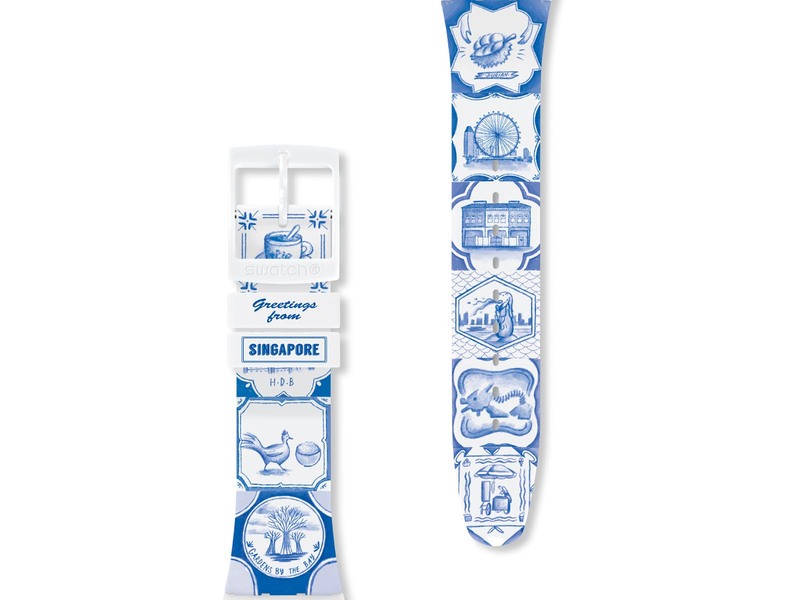 The Singapore Destination watch is priced at 125 Singapore dollars and is limited to 2500 pieces. It is available only at Swatch stores in Singapore. A pair of limited editions dedicated to the city state. A new battery gratis, available at any Swatch boutique.